When we last left our home on top of the mountain, Topsider had supplied us with the wrong center column bolts (they were too short). Gail had asked Topsider to send the correct bolts ASAP. Because we were still on the mountain, she told Topsider to ship them to our realtor Scott's office in Calaveras. By the time we left Calaveras on April 22, the correct bolts had not yet arrived. So when we got home, Gail contacted Topsider again, and told them to ship the correct bolts to our address in the Bay Area instead. On April 26, a box of bolts was delivered to our address on the mountain top. Because the driver could not get past the gate, he simply left them there on the ground (Gail learned this by contacting the shipping company). Our realtor Scott volunteered to go up to the property and retrieve the bolts. He looked around and didn't find anything. Gail contacted Topsider and told them to reship another set of bolts. On May 6, several boxes from Topsider showed up at Scott's office in Calaveras. He called us to let us know, and provided us with an inventory. Among the items (which, by the way, did not include the correct center column bolts!) were 200 ten-inch lag screws and 175 twelve-inch lag screws. Gail did not find these items anywhere in our other inventories, our many instruction manuals, or our blueprints. She called Brian R at Topsider to find out what they were for. Brian told here that they were for securing the floor panels and the roof panels respectively. Gail paused. We had already received hundreds of nine-inch spikes and eleven-inch spikes for securing the floor panels and the roof panels respectively. In fact, we had received them in the original shipment of building materials, as specified by the inventory and the instruction manual. Brian informed Gail that it was an error on Topsider's part. We should never have received the spikes. We should use the lag screws instead. Gail explained to Brian that our floor panels had already been installed. In fact, Russell had spent an entire day hammering almost 200 nine-inch spikes through the floor panels into the glu-lam beams with a sledge hammer back in April. Brian told Gail that we would need to take them out and replace them. Gail was livid. She reminded Brian that our inventory showed spikes, we were provided with spikes, and the manual said to use spikes. This was clearly Topsider's error. Brian pored over a copy of our blueprints, and found a tiny footnote on one of the pages that mentioned "lag bolts." He tried to explain that ours is an unusual situation because our house is specially engineered for wind. Gail: "Brian, I have your sales video. In your video, you talk about building these houses all the time in hurricane country. So we're not really such an unusual situation, are we?" Brian: "Uh... well... no. Not really." Brian admitted to some "communications problems" within Topsider, and acknowledged that we never should have had the spikes shipped to us. The big question was what to do about the 200 spikes that had been sledge-hammered into our floor panels. Russell went down to the local Orchard Supply Hardware store and explained the situation to one of the experts. He asked OSH how we would go about removing the nine-inch spikes from the glu-lam beams. The OSH man just gave Russell a funny look. "You can't get them out," he said. "Those spikes aren't going anywhere." Meanwhile, Gail pursued a different avenue. Our floors were completely indoors, and therefore shouldn't be affected by the wind. In fact, our wind is rated at 80 miles per hour, while standard Topsider houses are rated for winds of 90 miles per hour. Gail asked Topsider to go back to the original engineer, and have him write a letter declaring that nine-inch spikes were acceptable for the floor. Gail would in turn supply this to Dennis, our building inspector. Topsider agreed. On May 23, we received the letter from the engineer. It declared that eleven-inch spikes are acceptable for the floors, and nine-inch spikes are acceptable for the roof. At this point, all we could do was laugh. We will work to get the letter corrected. In the meantime, we will leave the nine-inch spikes where they are. After we replace the center column bolts with the correct ones (if we ever get the correct ones), we will secure the remaining floor panels with lag screws. 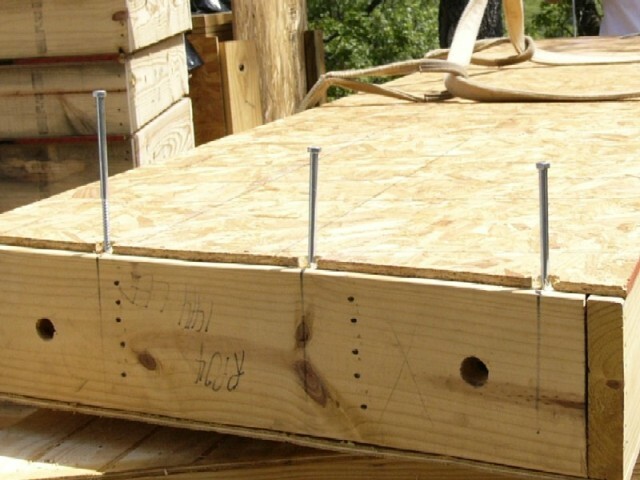 And for the roof, which is outside in the wind, we will use the twelve-inch lag screws... just to be on the safe side.